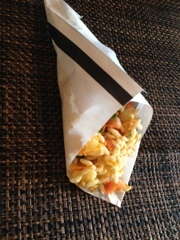 Kolkata “Jhaal” muri…. (Hot puffed rice). Staple fast food train ride snack on your way to Kolkata. 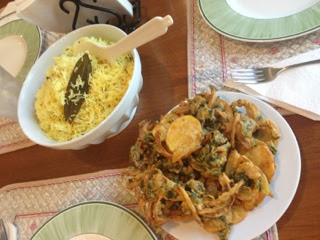 So many variations but the key is good quality raw mustard oil, green chillies, lemon juice and crispy puffed rice! Slow roast the puffed rice for 3-4 minutes on low heat. Let cool completely. Mix the above all together. Serve immediately! Mix all the above and chill for at least 30 minutes before serving. 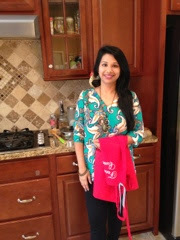 Perfect floral and flavorful Saffron Rice! 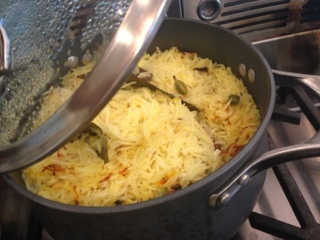 Saffron rice – Perfect accompaniment to any gravy or curry or just to eat as a side! 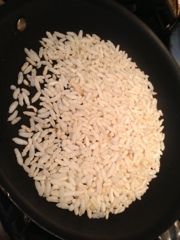 1 Cup of Basmati rice- Rinsed in a couple of changes of water and drained. Sauté cumin seeds and onions in 1 Tbsp of olive oil for 4-5 minutes till the onions turn translucent. If not using onions, saute for 2-3 minutes. Add the rest of the dry spices and saute for about 2 minutes. Add the basmati rice. Add salt and 2 cups of water. Mix well. Cover the pot and cook on low- medium heat for 15 to 18 minutes. Take the cover off to make sure all the water has evaporated. Add more water if the rice is still undone. Keep the pot covered for five more minutes and take it off the stove. 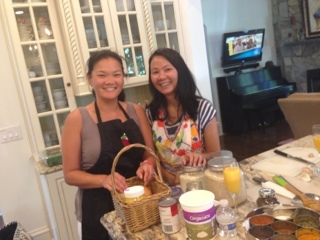 The rice should be separated and easily flaked using a fork. Add the Ghee before serving. 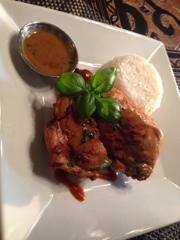 The ever green Chicken tikka masala! 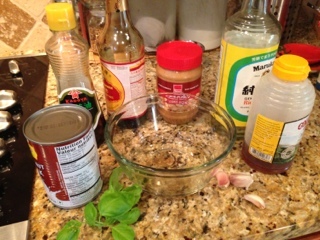 Marinate the chicken in the marinade for at-least 30 minutes. 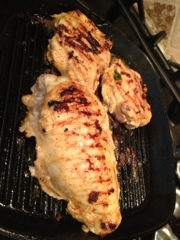 Broil the chicken for 6-8 minutes on each side for even cooking in a preheated oven or on a grill top. Sauté the onions garlic and tomatoes puree for about 10-12 minutes in 2 Tbsp of oil till the rawness of the onion fades away. 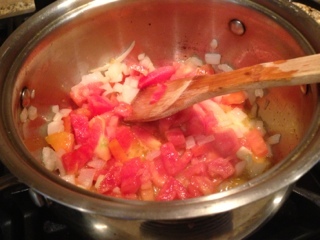 Add 2 tablespoon of tomato paste and mix well. 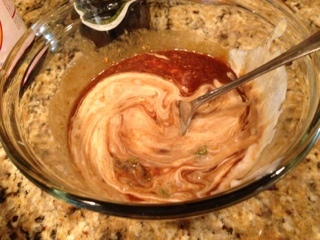 Cook for another 8-10 minutes till the mixture separates on the edges and you can see the oil on top of the sauce. 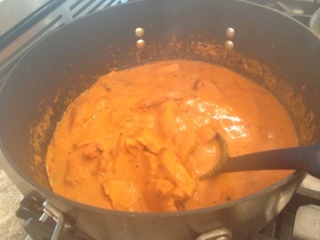 Add the dry masala and cook for another 4-5 minutes. 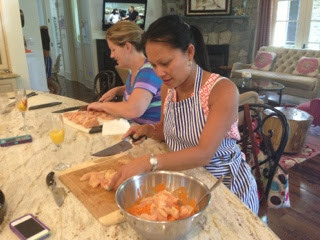 Add the chicken and toss well. Add the cream and one cup of water.Mix well and continue to simmer with a cover on low to medium heat for 8 to 10 minutes. Add more water if you desire a thinner sauce. Finish off with 1 teaspoon of sugar. 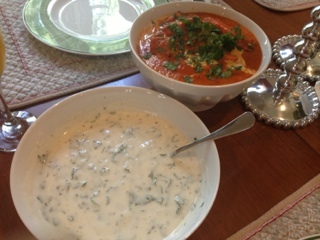 Mix well and serve with Saffron rice and/or Naan! 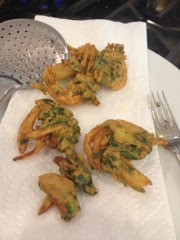 Nothing says “Tea time” in India than garam garam (Hot Hot) Pakoras (Fritters) !! Add the 1/2 cup of water to make a light batter. If you need more water, start adding Tbsp by Tbsp from the remainder 1/2 cup. The mixture should not be too thin but almost like a semi pancake batter like. 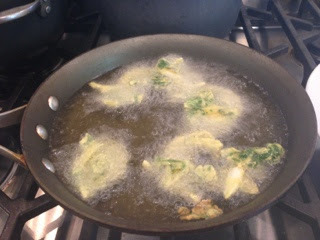 Heat about 2 cups of vegetable/canola oil for frying on medium heat to about 325-330 degrees. 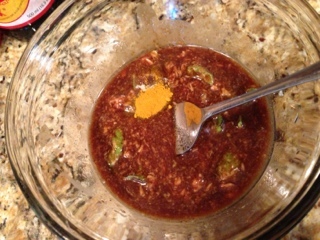 Drop in a small spoonful of the mixture to see if it rises up to the top. If it doesn’t, the oil is still cold. Allow for even browning and cooking on all sides for 3 to 5 minutes. Drain on paper towels and serve hot! 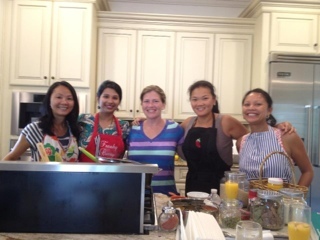 Come cook with me! Fun Saturday morning! 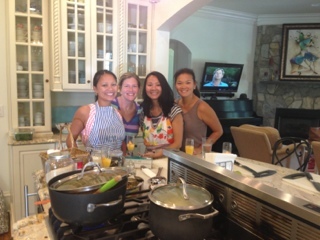 All set to cook ! 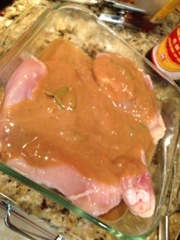 Marinate the chicken for atleast 30 minutes in the mixture. Grill on a hot grill or an indoor grill plan for 7-8 minutes on each side till you get nice grill marks. 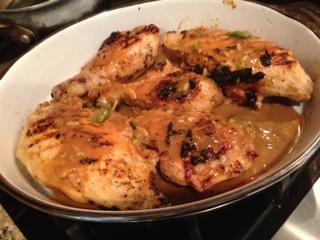 Finish off the chicken with the leftover marinade in a preheated oven at 350° for 12-15 minutes till the juices run clear when the chicken is pricked with a knife. 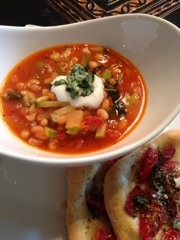 White bean and vegetable soup with pesto! Sauteé the onions, tomatoes and garlic in a couple of Tbsps of Olive oil for about 7-10 minutes till the onions turn pale pink and the tomatoes start to lose water. (You don’t want to caramelize the onions). Add the veggies and cook for about 5-6 minutes till they start getting soft. Add the beans and the broth. Season with salt and pepper to taste. 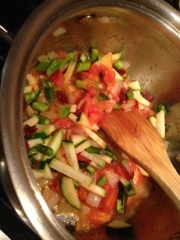 Cover the pot and simmer on medium heat for 15-18 minutes till the veggies cook to your desired level. Add the basil and stir the soup. Check for seasoning and consistency. 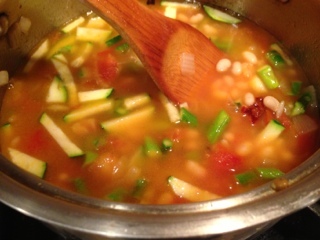 Add more broth for thinner soup or let cook without cover for thicker. 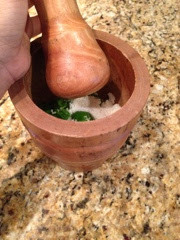 Enjoy with some Mortar and Pestle Pesto!! 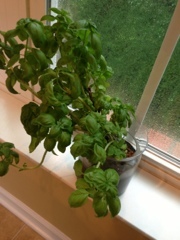 The texture of this pesto is much smoother than the blended version. Bacon and sundried tomato pizzettes! Roll out small pizza bases using a rolling pin. 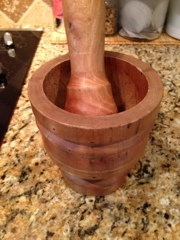 About 4-5″ in diameter. Arrange the toppings on the pizzettes. Bake in a preheated oven at 400 degrees for 10-12 minutes. 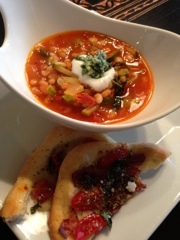 Finish with some Olive oil and Parmesan cheese.